Dad had an allotment in 1940 in order to grow food and so help the war effort by “Digging for Victory”. The allotments were situated in Fox Hollies Road, Acocks Green on ground now occupied by towers of high rise flats, and extended from the block of flats and shops on the parade to almost as far as York Road. The aforesaid block of flats/shops on the parade were built after the war ended on the site of a large static water tank which extended a long way back from Fox Hollies Road. Part of the Hall Green Little Theatre was also built on this site. The plot Dad was given is now part of the car park at Fox Hollies School. All this area of land was ancient undulating Saxon farm land, and once belonged to Lt. Col. Walker who resided in Fox Hollies Hall. All that was left of the Hall was its foundations and cellars and in 1940 they were flooded and I used to watch newts swimming in the pools. I was eight years old by then, and Dad, my brother John and I used to cycle from Mayfield Road to the allotment to work at weekends and in the evenings. Riding our bikes along the path I thought was fun, going up and down over the Saxon ridges. The first year on the allotment was very hard work because it had to be double dug, and the turf was very thick and tough so there was not a lot of time to spend sowing, but I think we managed to plant a few rows of potatoes. I wasn’t big enough to do the digging, but I soon learnt to plant and sow and also hoe up the potatoes as they grew. Some of the time I wandered into the Hall orchard and picked damsons, cherries, apples and pears - great fun climbing trees. My brother was evacuated with his school to Warwick during this time but some weekends he would cycle home and help on the allotment. Not that the Luftwaffe stopped their bombing at weekends! The blitz meant the R.A.F. moved in too. They brought a barrage balloon and a winch lorry, and the crew lived in wooden billet huts under the trees a few yards from the road. One day the balloon broke loose and its trailing cables damaged the roof of a shop on the corner of Hartfield Crescent. The scars can still be seen today. The allotments did not escape the blitz. One air-raid left a huge crater in the middle of the main path through the allotments, caused by a H.E. bomb, fairly close to Fox Green Crescent. Sometimes I collected incendiary bombs. The Germans used to drop baskets of them, and those that landed on soft ground did not explode. I used to pick up the unexploded ones by the tail fins and hand them over to an A.R.P. Warden, Bob Pratt, who had the plot next to ours. He lived close by on the corner of Greenwood Avenue and Fox Hollies Road and he took them home in a bucket of water or soil. 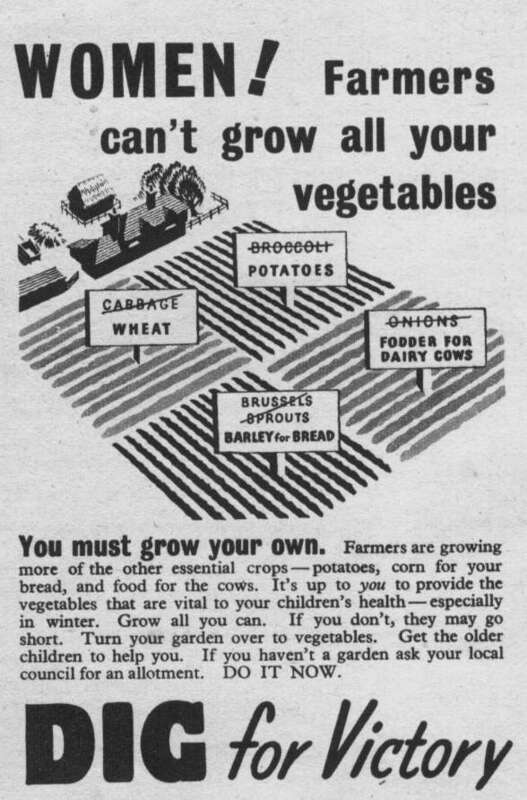 Despite all the problems encountered during the war we managed to grow some very good crops of various vegetables which added a lot to our food supply. It was good exercise and healthy eating. It is a pity the War spoilt it. As most of the men were in the forces and lots of women were working in factories, on the land and in the forces, the farmers were short of labour to pick the crops when they were ready. Our school was lucky enough to be chosen to help with the potato harvesting. A charabanc (coach now) would pick us up with our teacher Miss Boon, and away we went to a farm in the countryside not too far away. We would be put in teams and given buckets and allocated rows of potatoes to pick after they had been turned by the tractor. Mid-morning the farmer's wife would come to the fields on a cart pulled by the tractor with a large pot of hot cocoa for us, which also gave us a rest before we carried on. If it turned out to be a rainy day we were allowed into the barn which was half full of hay - of course we had a good time climbing up to the top of the hay and sliding down again. At the end of the day's work we were picked up by the charabanc and taken back to school. We always had a sing song on the way.